We don't have to tell you it's important to pulse your entire organization. Understanding how employees are feeling and getting a picture of the overall health of your organization's culture is invaluable. 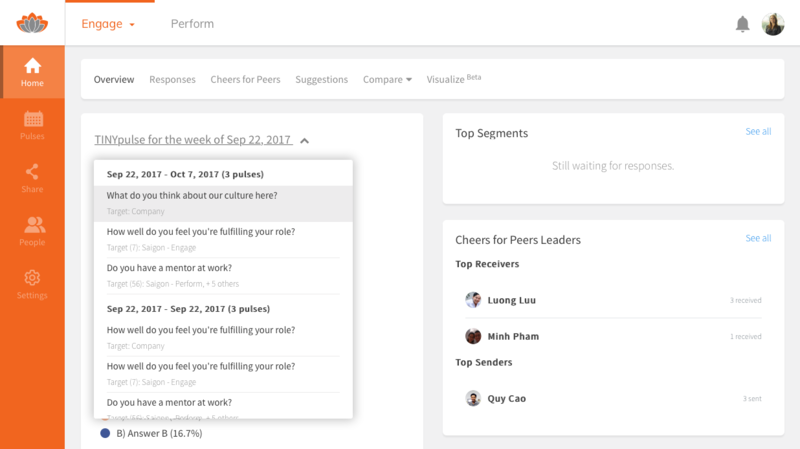 But it's also important to collect targeted feedback from certain locations and work groups, and that's where pulsing by segment comes in. (i) You must have Super Admin or Admin permissions in Engage in order to schedule pulses and manage questions. In addition to the main Engage pulse question, you can also send additional pulses to your segments. Segment pulses are designed to be sent when topics are at the top of your mind, so you can only create segment pulses for the very next pulse that's queued to go out. Go to the Engage Dashboard and open the Pulses section using the left side navigation. 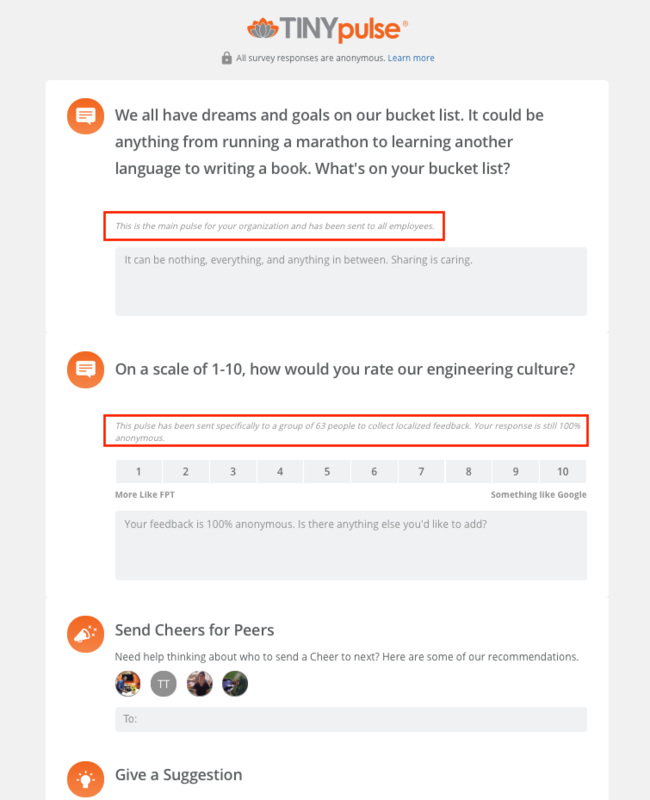 Enter your question by choosing one from the question bank or creating a custom question. 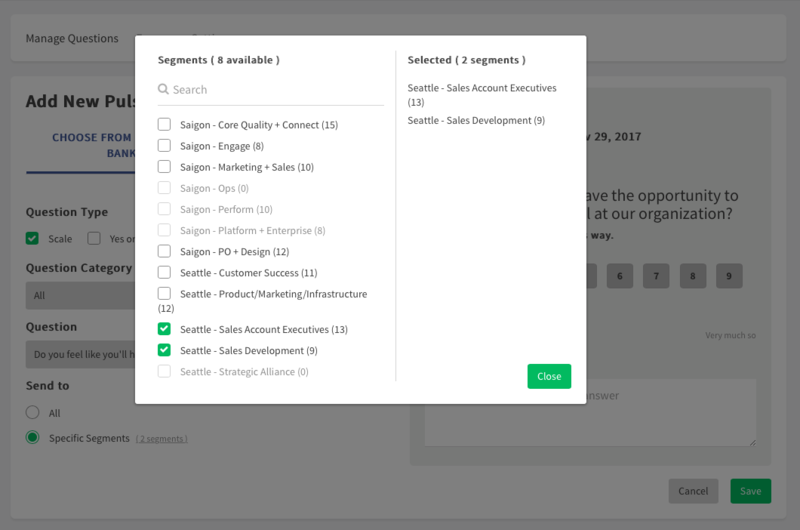 Select Specific Segments in the Send to section. Choose which segments to have this pulse sent to. You can choose one or many. Verify your question in the preview window and Save when you're done. Your segment level question will now appear in the queue for the very next pulse that's scheduled to go out. 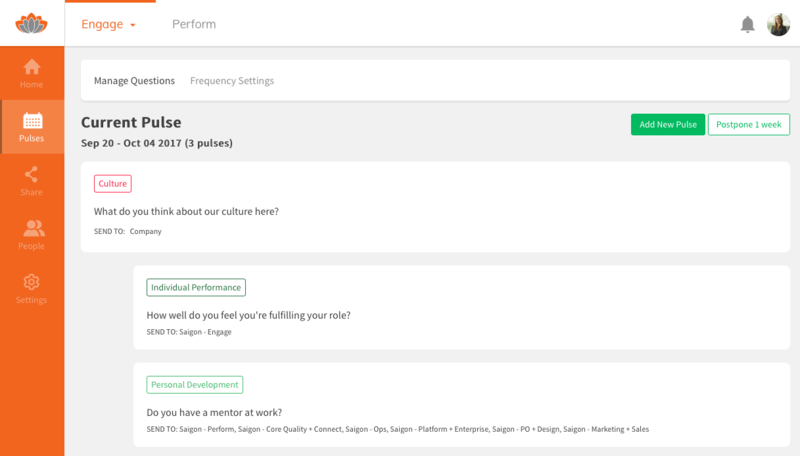 All employees will get the main Company pulse and employees belonging to a segment scheduled to get a Segment pulse will get that question as well (two surveys for the week). 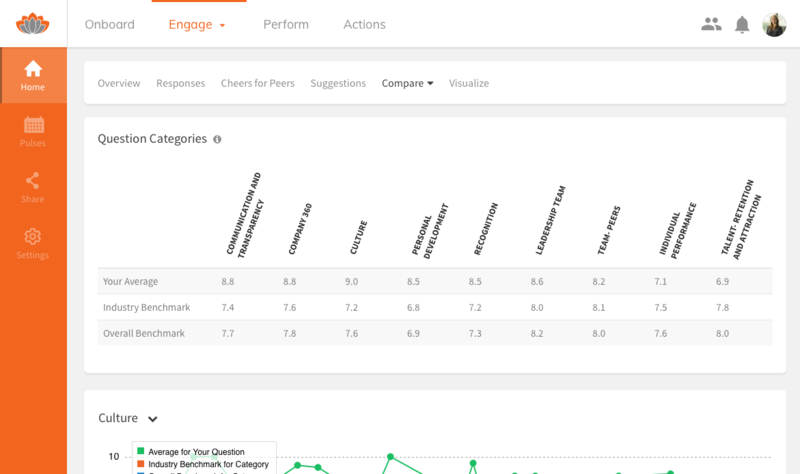 Viewing segment level results on the Engage Dashboard is easy. From the Overview or Responses pages, just click the arrow next to the TINYpulse for the week of... label to view all of the available questions. 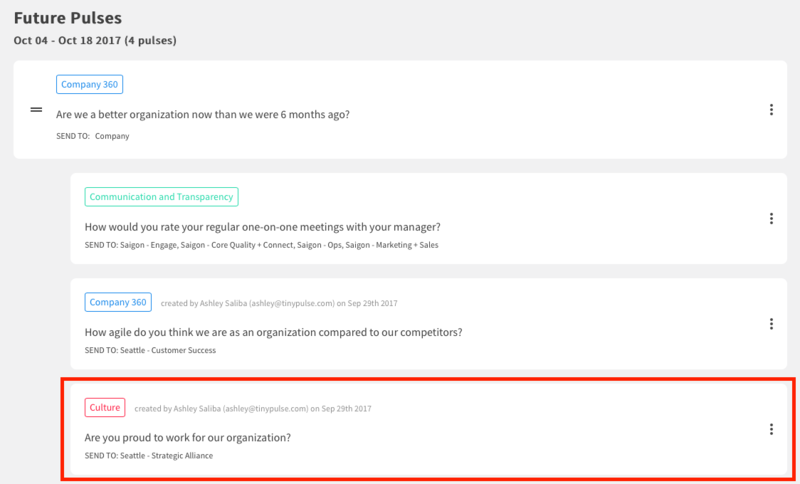 Results from the main company question are separate from the segment level questions so you can get clear insights on sentiment from a specific segment or the org as a whole. Employees receiving two pulses (the main company survey and a segment level question) will receive still receive just one email from TINYpulse, and both questions will appear on the same survey page. We like to "keep it tiny" and uncomplicated so employees won't feel burdened by the additional question. Employees can respond to both questions, one of them, or neither. They can even respond to one now and go back to give their feedback on the other later so they can respond on their own time. Can I schedule a segment pulse to be sent in the distant future? No; segment pulses can only be scheduled for the very next pulse. Administrators cannot schedule segment pulses for any company pulse beyond the next one that is scheduled depending on your cadence (every week, every two weeks, ever four weeks). Who can schedule segment pulses? Engage Super Admins and Admins can schedule segment pulses. Segment admins cannot create a pulse for their segments of responsibility. Segment admins should kindly reach out to their friendly Super Admin or Admin for assistance scheduling a pulse for one of their segments. Can I still send a segment pulse if the company pulse has been paused? No; pausing a company pulse will automatically pause any segment pulses that have been scheduled. Segment pulses will also be resumed once the main company pulse has been unpaused. Do segment pulses contribute to the Compare -> Categories calculations? No; segment pulses are designed to collect localized feedback from specific groups so results may not be an accurate representation for your entire organization. Therefore, segment pulses are not included in Compare -> Categories metrics.